Beneath a full moon, Raph prowls the rooftops, lamenting that he’s likely in for a slow night. His whining is suddenly interrupted by a mysterious and eerie howling. Raph turns around to find a massive, monstrous canine creature sneaking up on him. Raph draws his sai but is too slow; the werewolf hurls him across the rooftop and into a pile of wooden crates. Before Raph can recover, the beast pounces on him and begins closing-in with his claws and fangs. Raph’s bad luck turns around, however, when a dark, hooded figure bearing a skull-topped staff orders the werewolf to stop. The hooded creep thanks Raph for looking after his “pet”, who tends to get frightened when lost. The hooded weirdo and the werewolf cheerfully wave goodbye and then vanish in a cloud of smoke. Raph is still dizzily recovering. *This won’t be Raph’s last encounter with a werewolf. He’ll do battle with the beasts again in Tales of the TMNT (Vol. 2) #7 and in Tales of the TMNT (Vol. 2) #39. *The original printing of this story contains several spelling errors that were fixed for the Shell Shock printing: "Raphael" was originally misspelled "Rapheal" on Page 1 and "too" was misspelled "to" on Page 2. A story this awesome should be longer than four pages. I am an absolute horror fanatic, so needless to say, I relish every story drawn by the great Eric Talbot. I waxed on about my thoughts on his style pretty in-depth in my review for “Not One Word!”, but the guy’s creepy horror-themed art is just phenomenal. 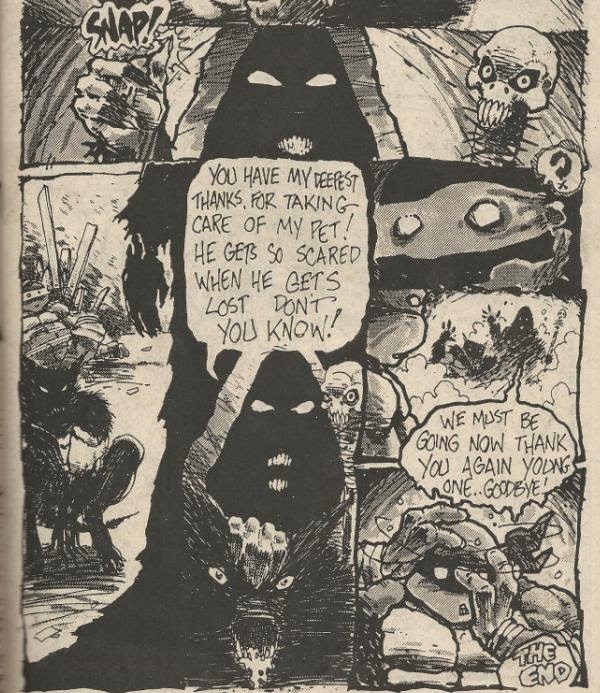 So, naturally, he’s best when employed to draw actual horror-centric TMNT stories! Whoda thunkit? “The Howl” boils down to nothing more than a four-page comedy relief strip, but next to “Turtle Soup and Rabbit Stew”, it ranks as one of the highlights of the “Turtle Soup” one-shot. Although the gag strip nature means that extending it past a handful of pages would have been a bit pointless (contrary to my first sentence in this review), its more the visuals that sell the thing than the “story”. On a sidenote, when I read “The Howl”, I can’t help but get something of a “Marvel Zombies” vibe from the way Talbot constantly has the werewolf and the hooded figure bearing their gnarly teeth as if they lacked lips (ala Sean Phillips in “Marvel Zombies”). It’s an effective style that looks especially cool on the hooded figure. As it stands, I’m running out of ways to say “the art was cool”, so I’m gonna wrap this up. I'm so glad you've gone off on a Talbot kick! I shared your sentiment about this story when I first read through Shell Shock. Of all that book's 200 pages, these 4 by Talbot completely steal the show for me. To this day, I STILL want to see this incident fleshed out, though Talbot's has evolved his style dramatically over the years and it probably wouldn't be quite the same. 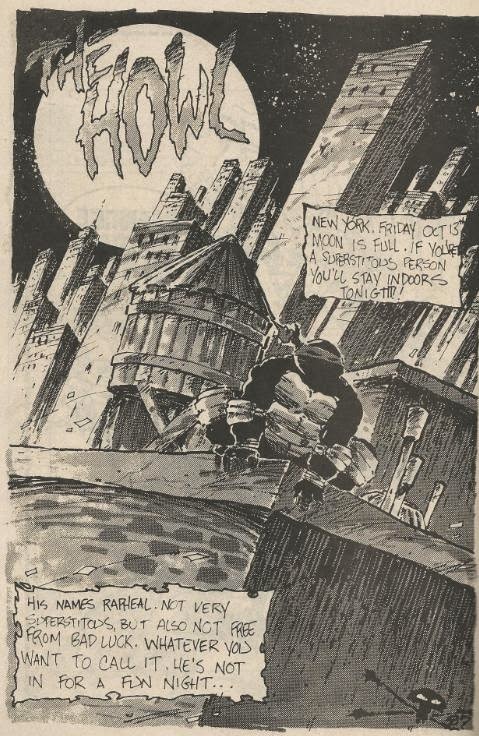 I noticed you placed this in 1986 on the mirage timeline (same year as TMNT V1 #8) but the earliest year where october 13 falls on a friday is 1989. I know it's nitpicking but I felt I should point it out. Great site though, my compliments. Another bulletpoint for the "Ninja Tips": Raphs name is misspelled on page 1 ("His names Rapheal").